From Rice Ranch, Quartzsite, Arizona Quartzsite, Arizona is the third largest city in Arizona ... during a short period of time every January. I first heard of Quartzsite from a shopper at my pre-retirement garage sale. 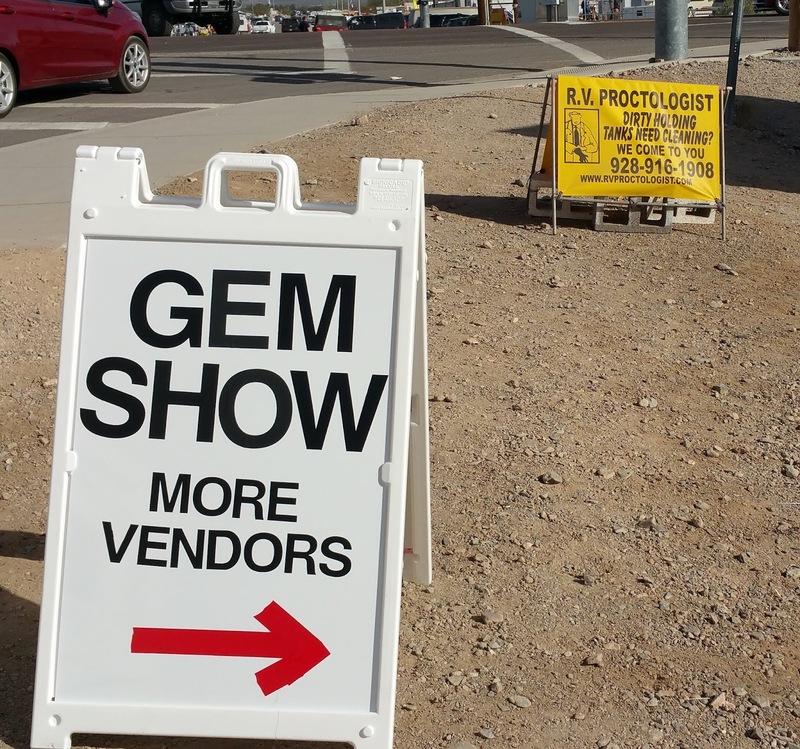 We've never attended the big RV show in Quartzsite but we drove through the tiny desert town during February 2011 and were, naturally, unimpressed. The annual Quartzsite RV Show was not on our bucket list but nearly everyone we met seemed to think it should be. But..... as things happen, we learned the 2016 Quartzsite RV Show corresponded with our trip to Arizona quite by accident. The four of us agreed to tweak our our itinerary so we could witness the spectacle firsthand. 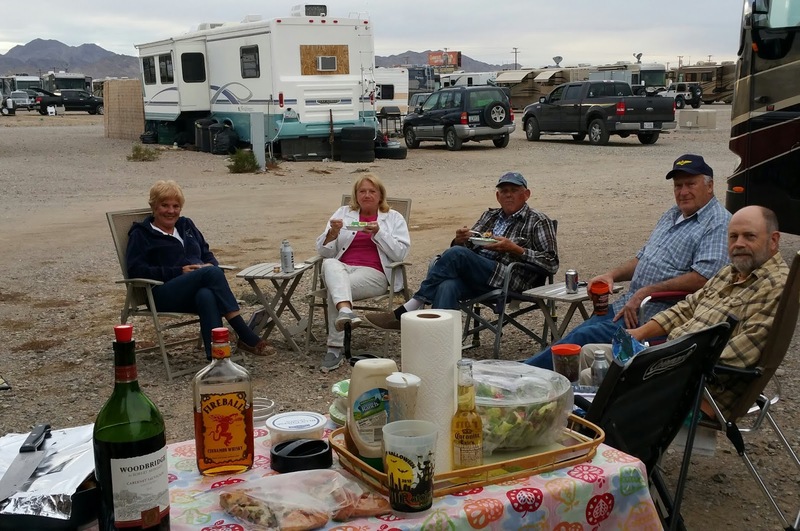 Vera and John, our friends from Phoenix, recommended Rice Ranch, a campground across the street from the big tent area in Quartzsite. Having never experienced this event, we didn't want to risk camping on BLM (Bureau of Land Management) the first time so we called Rice Ranch. It didn't take much to persuade our friends, Suzi and Jim to join us for a few days visit at the 33rd Annual RV Show in Quartzsite. The ride from Yuma to Quartzsite on Sunday, January 17th, was only about 80 miles, driving north on U.S. 95. 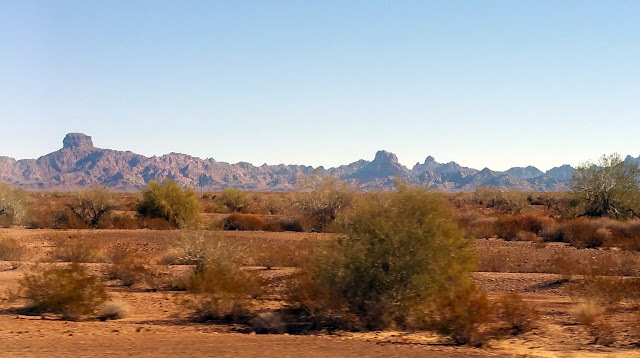 The desert scenery along the way was nice, if you like desert and I do. 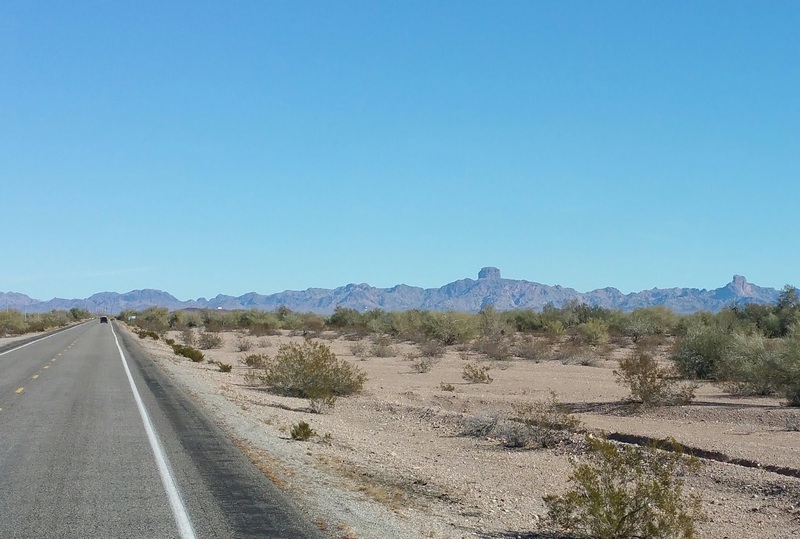 Our ride north from Yuma on U.S. 95. Drawing nearer to Castle Dome and then beyond. We reached Quartzsite around lunchtime, behind Suzi and Jim and Pam and Ernie who were already there. Within minutes, I saw the familiar army green hat of my friend Vera. She and John were parked directly ahead of Pam and Ernie, who were to our immediate left. Vera brought us two large bags of delicious citrus... tangelos and oranges from the trees at their home outside Phoenix. What a treat! 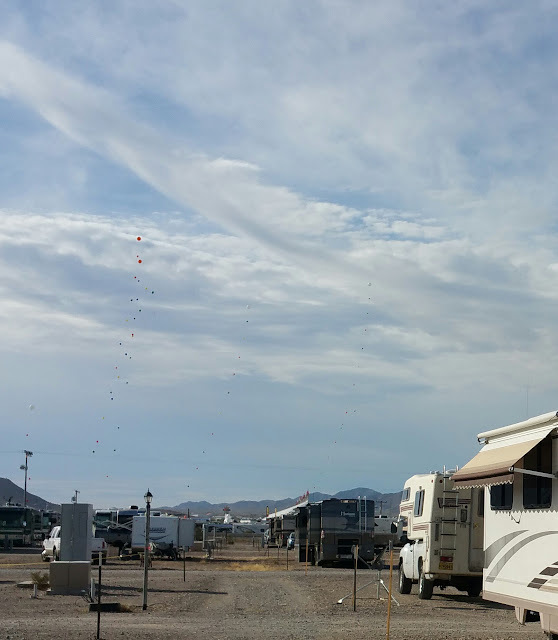 We navigated through a maze of camping rows to reach our campsite. Quartzsite is a dusty desert town with two exits off I-10 less than ten miles east of the California state line. 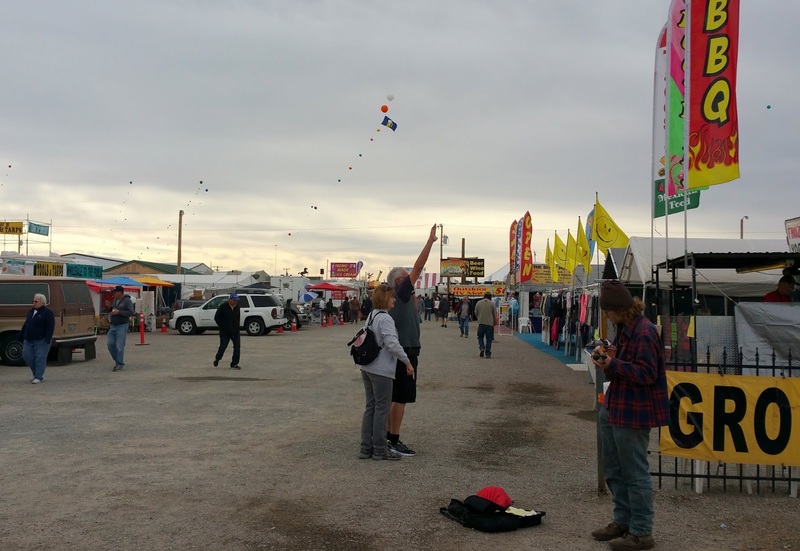 While it's population swells to the point of bursting during the various shows, the town's official population was less than 5,000 in a recent census. 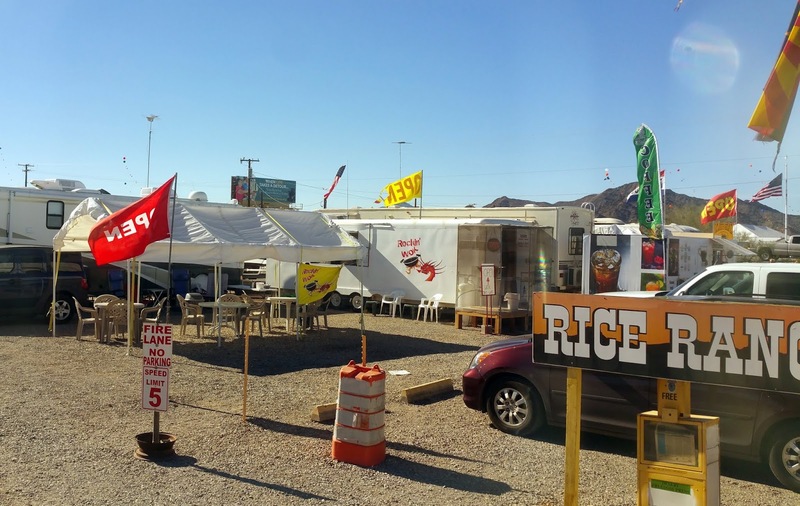 One can visit the RV show in Quartzsite without spending a single red cent. 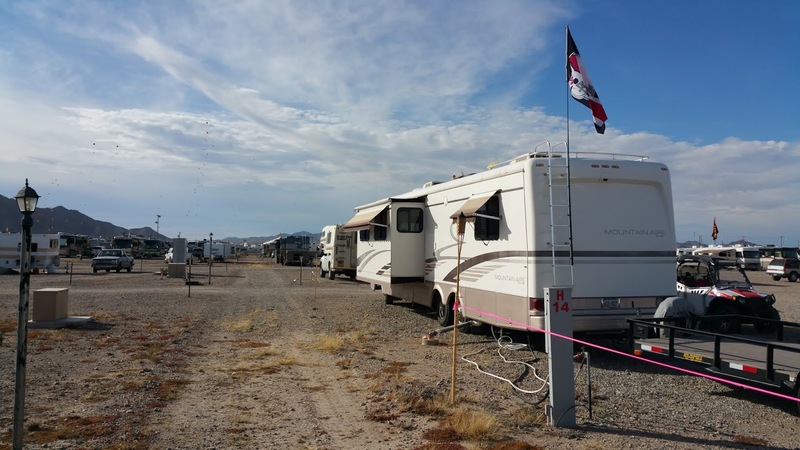 Camping on BLM property is virtually free, car parking is free and admission to the show costs nothing. That can be good, but is mostly a bad thing in my view for all the obvious reasons. 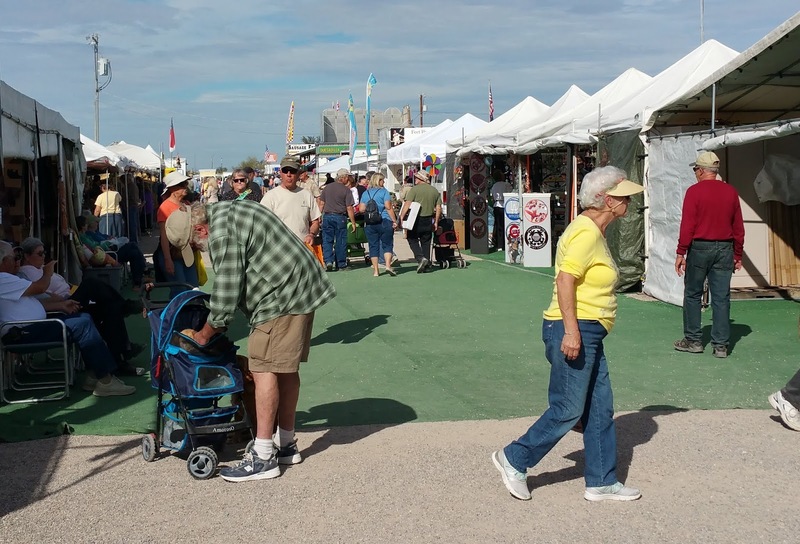 Looking toward the Big Tent at Quartzsite. Colorful helium balloons fly high over the show area. The afternoon we arrived, Wayne and I ate lunch and then headed for the big tent. Lexie and Ozzie stayed home as the rocky grounds would be too difficult to push the stroller through. I didn't take pictures that afternoon. 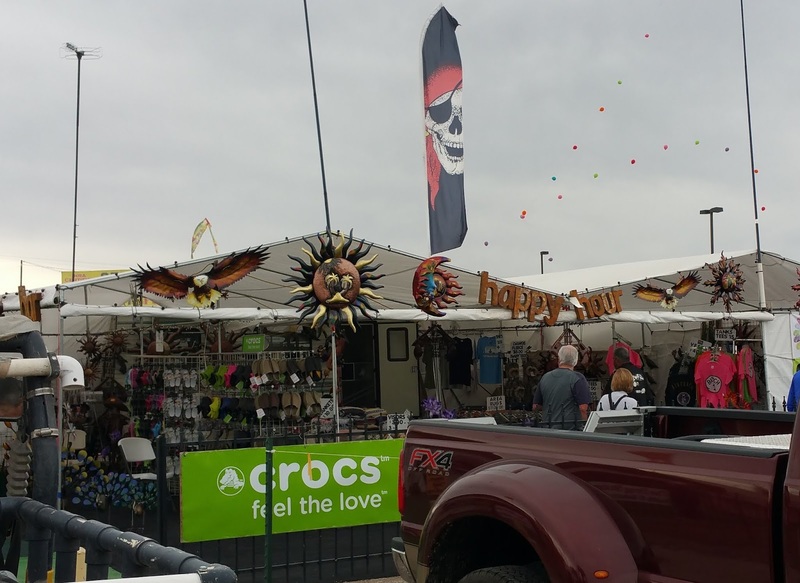 Next day we wandered among the vendors beyond the tent. People milling about looking at....? Meanwhile, talent challenged musicians play at music on every corner. One woman sat on the ground banging the bottom of a 5 gallon bucket. 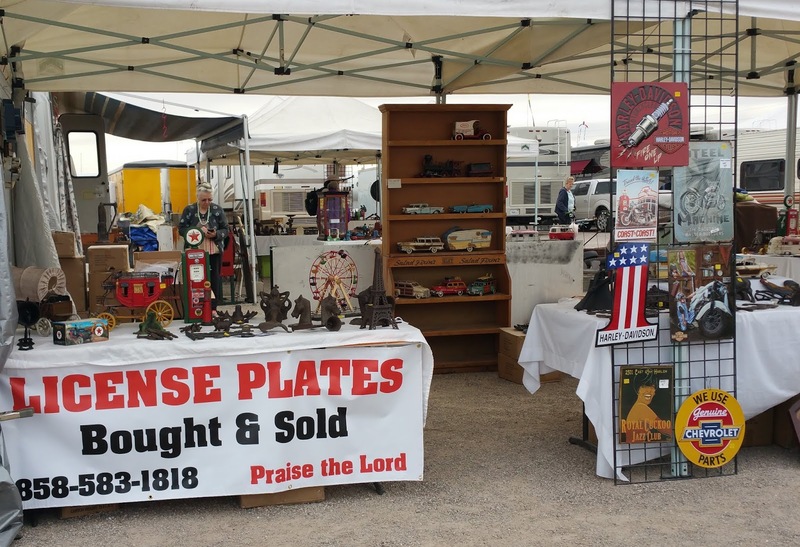 Buying and selling junk mostly. Praise the Lord. There were no RV manufacturers represented at the Quartzsite show. 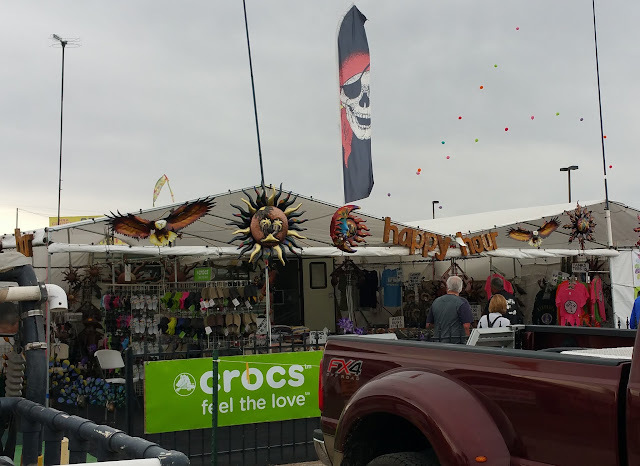 I saw one dealership with inventory on the show grounds. About six new Entegra coaches were on display and some used ones. 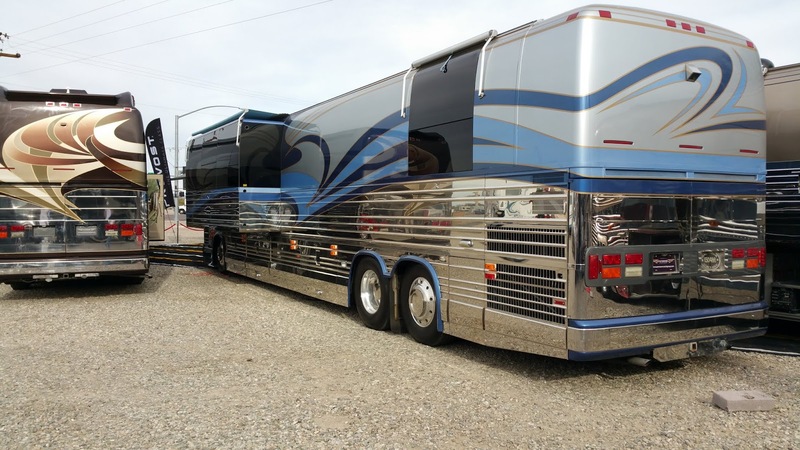 We looked in nearly all the new coaches and a few used ones. 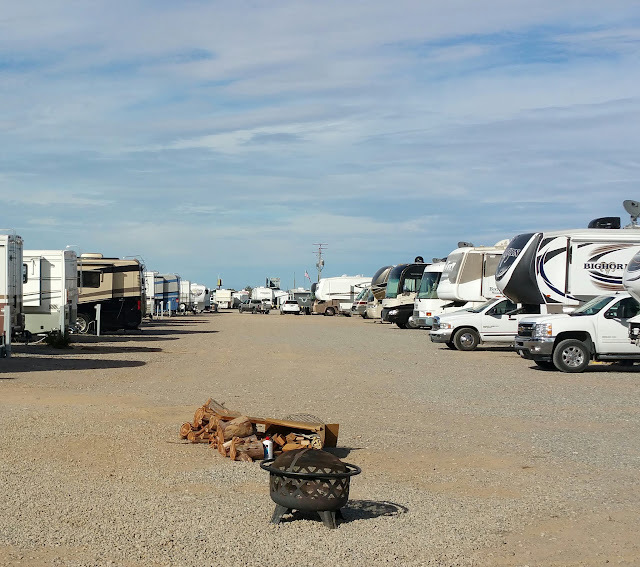 On Tuesday we drove to La Mesa RV and looked around at the inventory on their Quartzsite lot. 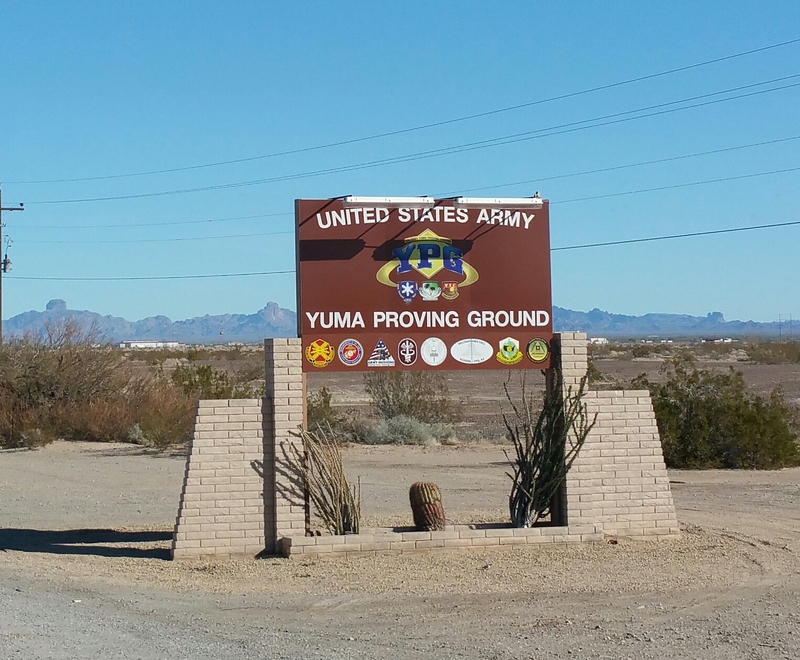 Several units we'd seen at their Yuma location had been brought to Quartzsite but their prices were not reduced. 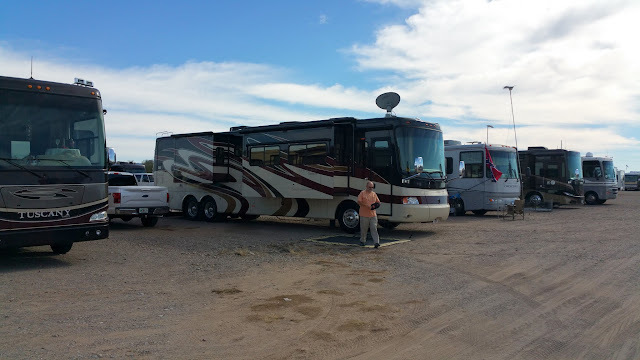 A couple of Prevosts, a Newel, a Zephyr and a few others were at this lot. The best part of being in Quartzsite was our early evening happy hour, dinner and campfire get-togethers. 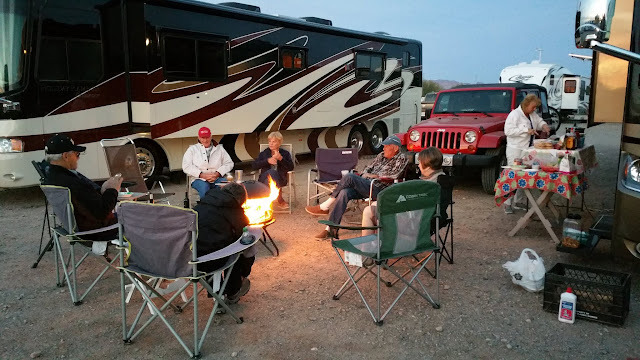 We enjoyed three nights: hot dog night, pork roast and chicken chili night and pizza night. All prefaced with early happy hour. We are retirees, after all. Jim and Suzi. Notice the Suzy RIP grave marker beside her. Ernie found it near a dumpster, obviously a dog's grave marker, which was, sadly, removed and discarded. 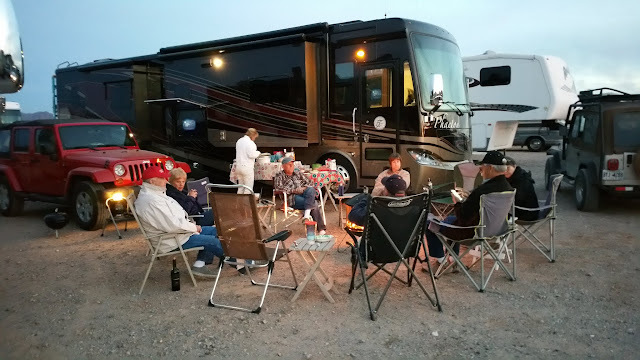 John and Vera's Fleetwood Expedition and the first evening's sunset. Second night. Chicken chili and grilled pork roast. Grilled pork roast and chicken chili night. 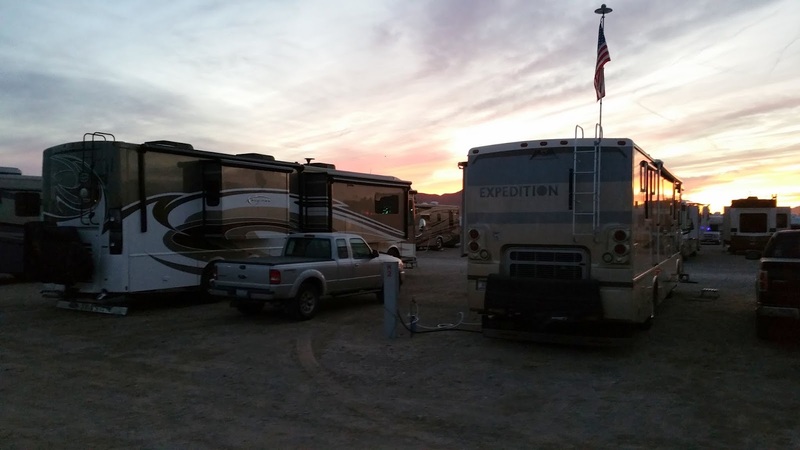 Left to right: Jim, Suzi, Pam (standing), Ernie and Adia. On Tuesday morning, John and Vera left us. Pam and Ernie, Wayne and I had to change sites that day too. 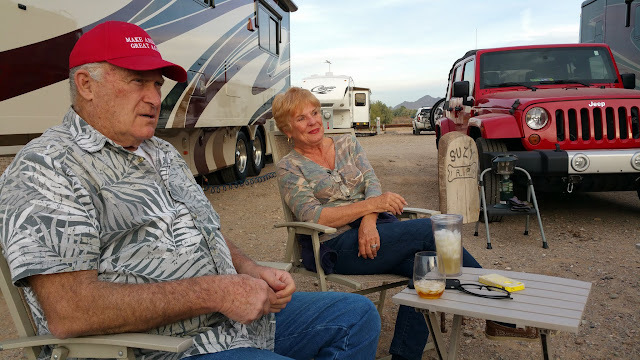 We would have one more evening together with Jim and Suzi before they returned to Yuma and the four of us moved on to southern California. 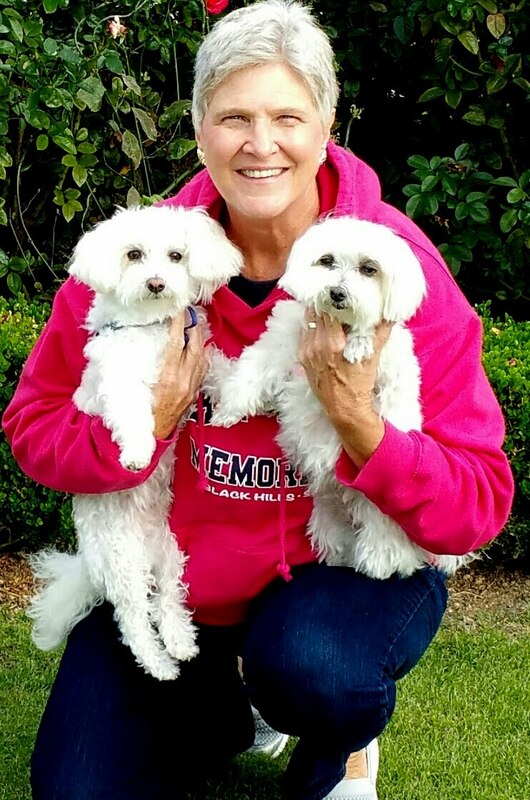 Left to right: Vera, me and Pam in our best K-mart pose. 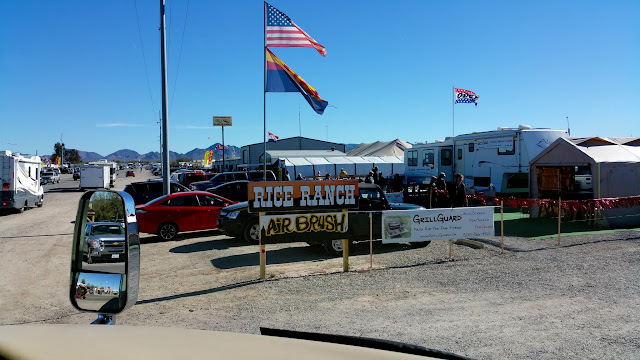 Our second site at Rice Ranch. Just as dusty as the first one. Tuesday was our last full day at Quartzsite. 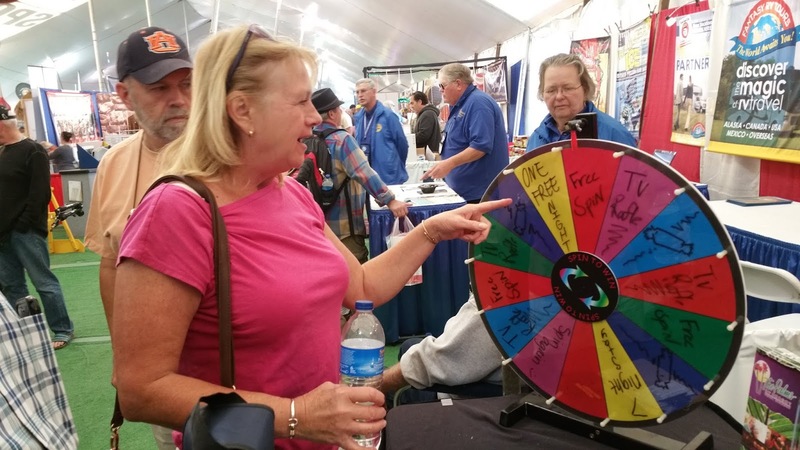 We made a final visit to the big tent and took turns spinning the wheel for prizes from The Palms RV Resort in Yuma. No, we're not going back to collect our winning. Pam took a turn at The Palms of Yuma's wheel of fortune. 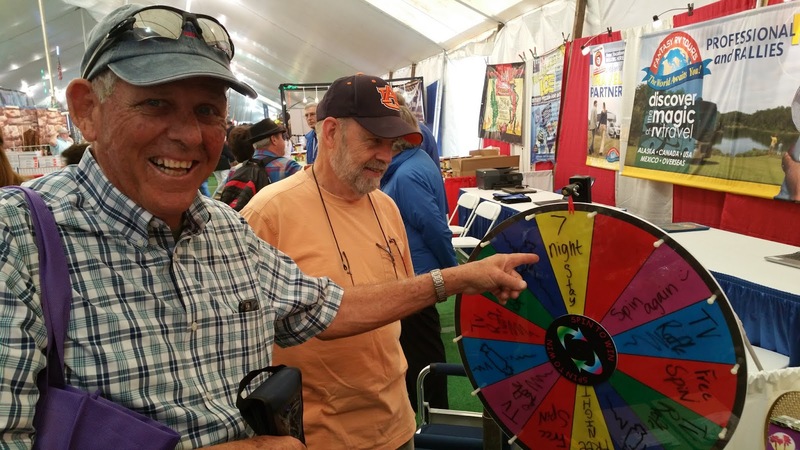 Ernie won a 7-night stay at The Palms in Yuma! Wayne won a one-night stay. 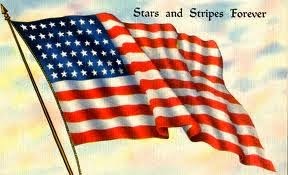 I won "notta"
Wayne and Ernie both got lightweight, telescoping, lighted flagpoles and American flags for the coaches. That would be our big purchase of the show. We bought them at the Flag Pole Buddy vendor booth. Pam and I made a final purchase. It was the important selection of a small "natural" gift for our travel pal and good friend, Joyce. We pored over hundreds of pieces looking for the perfect one for her collection. Can't post a picture of it here as we don't want to ruin the surprise. 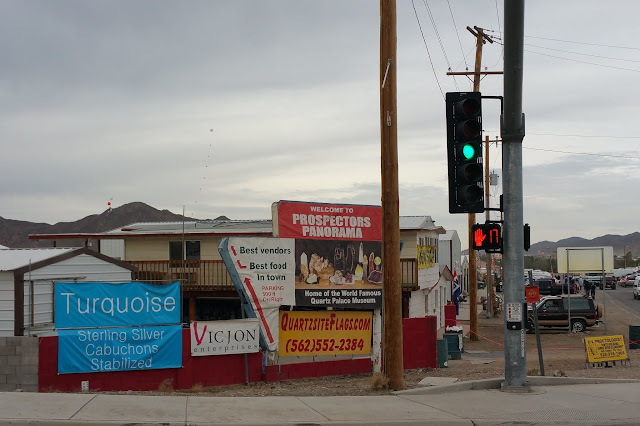 Look beyond the first sign to the yellow one behind. R.V. Proctologist - RV tank cleaner. Yuck. Tuesday. Pizza night. Our last evening at Rice Ranch. John and Vera are gone. Fireball for the daring among us. That would be Jim. A parting shot of Rice Ranch. 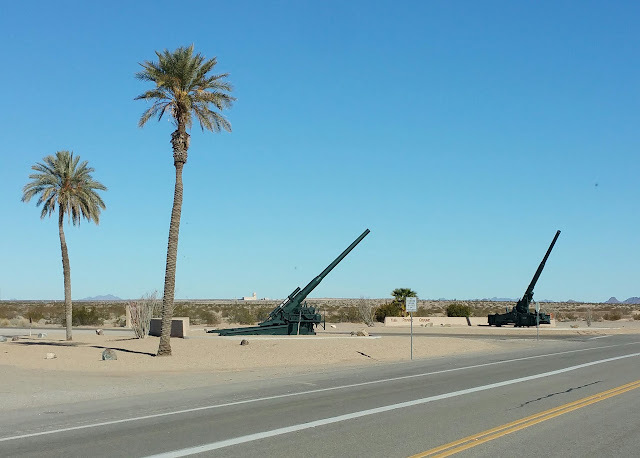 Quartzsite is officially checked off now. Wayne and I are both glad we went and we had a good time. We agree we probably wouldn't go again.